2003-10-13 Assigned to CARGILL, INCORPORATED reassignment CARGILL, INCORPORATED ASSIGNMENT OF ASSIGNORS INTEREST (SEE DOCUMENT FOR DETAILS). Assignors: BOHLMANN, JOHN A., FOSDICK, LAWRENCE E., RAY, BRENDA L., TRINKLE, JAMES R.
2005-05-20 Assigned to CARGILL, INCORPORATED reassignment CARGILL, INCORPORATED ASSIGNMENT OF ASSIGNORS INTEREST (SEE DOCUMENT FOR DETAILS). Assignors: BOHLMANN, JOHN A., FOSDICK, LAWRENCE E., ROGERS, BRENT DANIEL, DEGRANDIS, PAULA A.
Glucosamine suitable for human or animal consumption is disclosed. The glucosamine is derived from fungal biomass containing chitin. Various methods of producing glucosamine by acid hydrolysis of fermented fungal biomass are also disclosed. The present application is a continuation-in-part of copending U.S. patent application Ser. No. 10/326,549 filed Dec. 19, 2002, which is a continuation of U.S. patent application Ser. No. 09/785,695 filed Feb. 16, 2001, and claims priority from PCT Application No. PCT/US02/04468 filed Feb. 15, 2002, each of which is incorporated herein by reference. Also disclosed are various methods for producing glucosamine compositions by acid hydrolysis of fungal biomass. The methods for obtaining glucosamine compositions from microbial biomass include, for example, reacting chitin-containing biomass in a relatively concentrated acidic solution at a relatively elevated temperature. Also disclosed are methods for obtaining glucosamine compositions from microbial biomass by, for example, reacting the chitin-containing biomass in a relatively mild acidic solution and then in a relatively concentrated acidic solution. In an alternative embodiment, the microbial chitin-containing biomass is reacted with a basic solution before or after acid hydrolysis treatment. In yet another embodiment, fungal biomass is treated with an acidic solution at an elevated temperature and/or pressure to produce glucosamine compositions. FIG. 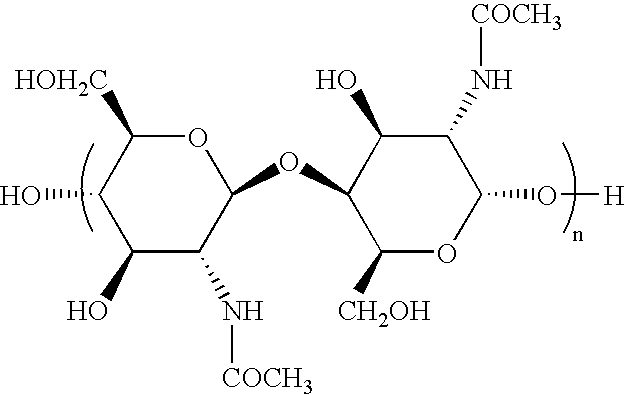 8 is an HPLC chromatogram that compares water-soluble components of an embodiment of the disclosed composition to glucosamine derived from fungal biomass indicating that no levulinic acid or dextrose was detected in the shellfish-derived glucosamine. 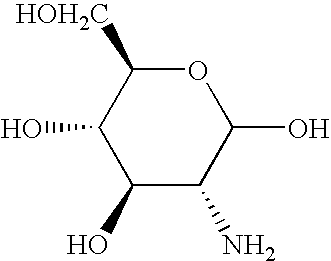 Melanoidins are reported to possess antioxidant and/or free radical scavenging character. See, e.g., Gow-Chin Yen, et al.,  Antioxidant Activity and Scavenging Effects on Active Oxygen of Xylose-Lysine Maillard Reaction Products, J. Sci. Food Agric., 67, 415-420 (1995); K. Eichner, Antioxidant Effect of Maillard Reaction Intermediates, Prog. Fd. Nutr. Sci., 5, 441-451 (1981); Fumitaka Hayase, et al., Scavenging of Active Oxygens by Melanoidins, Agric. Biol. Chem, 53(12), 3383-3385 (1989); Dejian Huang, et al., High-Throughput Assay of Oxygen Radical Absorbance Capacity (ORAC) Using a Multichannel Handling System Coupled with a Microplate Fluorescence Reader in 96-Well Format, J. Agric. Food Chem., 50, No. 16, 4437-4444 (2002), each of which is incorporated herein by reference. Certain embodiments of the glucosamine compositions disclosed have lipophilic oxygen radical absorbance capacity values (lipo-ORAC values) of from 30 μmole TE/g (TROLOX equivalent per gram) to 150 μmole TE/g or lipo-ORAC values of from 35 μmole TE/g to 100 μmole TE/g or from 35 μmole TE/g to 50 μmole TE/g. TROLOX is also known as 6-hydroxy-2,5,7,8-tetramethyl-2-carboxylic acid. The lipo-ORAC values may be determined, e.g., by use of an ORAC assay using fluorescein (FL) as a fluorescent probe as discussed in Dejian Huang, et al.,  Development and Validation of Oxygen Radical Absorbance Capacity Assay for Lipophilic Antioxidants Using Randomly Methylated β-Cyclodextrin as the Solubility Enhancer, J. Agric. Food Chem., 50, No. 7 (2002), which is incorporated herein by reference. Randomly methylated β-cyclodextrin (RMCD) is used as a water solubility enhancer for lipophilic antioxidants. Seven percent RMCD (w/v) in a 50% acetone-water mixture is used to solubilize the lipophilic antioxidants in 75 mM phosphate buffer (pH 7.4). When using TROLOX as the standard (1.0), α-tocopherol, (+)-γ-tocopherol, (+)-δ-tocopherol, α-tocopherol acetate, tocotrienols, 2,6-di-tert-butyl-4-methylphenol, and γ-oryzanol have ORAC values of 0.5+/−0.02, 0.74+/−0.03, 1.36+/−0.14, 0.00, 0.91+/−0.04, 0.16+/−0.01, and 3.00+/−0.26, respectively, when using this method. Suitable starting materials for producing the disclosed glucosamine compositions include microbial biomass sources, typically fungal biomass, such as filamentous fungi having greater than 10 percent chitin by total dry cell weight, such as fungal sources derived from Aspergillus sp., Penicillium sp., Mucor sp. Suitable fungal biomasses include  Aspergillus niger, Aspergillus terreus, Aspergillus oryzae, Mucor rouxii, Penicillium chrysogenum, Penicillium notatum, Saccharomyces cerevisiae; Saccharomyces uvarum; and in particular Candida guillermondi, Aspergillus niger, and Aspergillus terreus. The biomass may be recovered from a commercial fermentation reaction, such as the commercial production of organic acids, including citric acid. Also, biomass suitable for production of glucosamine can be generated specifically for this process and not as a byproduct of other processes. As used herein, the term microbial does not include phyto-plankton and crustaceans or mollusks. The remainder of the increased temperature and/or pressure methods for producing glucosamine compositions from fungal biomass follows those steps outlined in the above-described methods (such as shown in FIG. 2 or  3). Specific examples of the increased temperature and/or pressure methods for producing glucosamine compositions are set forth below. Citric acid fermentation biomass ( A. niger) was mixed with hydrochloric acid (JT Baker's 37 percent Reagent Grade) and placed in a sealed small scale microwave digestion bomb, available from Alltech. Prepared samples were placed in a laboratory vacuum oven with no vacuum applied. The oven was capable of maintaining a temperature of 160° C. Samples were prepared and treated under the conditions listed in Table 3 below. (c) converting the chitin in the fungal biomass to glucosamine. 2. The method of claim 1 wherein the breaking down the cell walls of the fungal biomass to release at least a portion of proteins, lipids and/or polysaccharides therein, without converting a substantial amount of chitin to glucosamine comprises treating the fungal biomass with a first acidic solution of from about 0.5 to 12%. 3. The method of claim 1 wherein chitin in the fungal biomass is separated from at least a portion of the proteins, lipids and/or polysaccharides prior to converting the chitin to glucosamine. 4. The method of claim 2 wherein the first acidic solution comprises hydrochloric acid at a concentration of from about 1 to about 2%. 5. The method of claim 1 wherein the breaking down the cell walls of the fungal biomass comprises treating the fungal biomass with a first acidic solution having a concentration of from about 0.05 to 20% at a temperature of from about 60° C. to about reflux temperature of a mixture of the fungal biomass and acidic solution. 6. The method of claim 1 wherein the converting the chitin to glucosamine comprises reacting the chitin with an acidic solution having a concentration of from about 5 to about 20%. 7. The method of claim 1 wherein the converting the chitin to glucosamine comprises reacting the chitin with an acidic solution having a concentration of from about 1 to about 2%. 8. The method of claim 2 wherein the first acidic solution has an acid concentration of less than about 5% and wherein the fungal biomass and first acidic solution are mixed at a reaction temperature of less than about 100° C. for a reaction period of less than about 4 hours. 9. The method of claim 2 wherein the fungal biomass is treated with an alkaline solution prior to breaking down of the cell walls with a first acidic solution. 10. The method of claim 9 wherein the alkaline solution comprises sodium hydroxide at a concentration of from about 1 to about 4%. 11. The method of claim 1, wherein the fungal biomass comprises Aspergillus sp., Penicillium sp., Mucor sp., and combinations thereof. 12. The method of claim 1, wherein the fungal biomass yields greater than 50 percent of total chitin content of the biomass starting material. 13. The method of claim 1, wherein the glucosamine composition contains less than 5 percent glucose. 14. The method of claim 1, wherein the glucosamine composition contains greater than 98 percent glucosamine based upon dry weight. (d) separating the glucosamine from the acidic solution. 16. The method of claim 15 wherein the acidic solution has an acid concentration of greater than 5 percent. 17. The method of claim 15 wherein the reaction temperature is greater than 80° C. and is reacted for a period of at least 4 hours. 18. The method of claim 15 wherein the alkaline solution comprises sodium hydroxide at a concentration of from about 1 to about 4%. 19. The method of claim 15, wherein the glucosamine separated from the acidic solution contains less than 20 parts per million heavy metals. 21. The method of claim 20 wherein the reaction temperature is from about 105° C. to about 160° C.
22. The method of claim 20 wherein the reacting of fungal biomass in an acidic solution is performed at a pressure greater than atmospheric pressure. 23. The method of claim 20 wherein the reaction temperature is from about 105° C. or greater and the reaction takes place at a pressure of about 2 atmospheres or greater. 25. The composition of claim 24 wherein the composition comprises from about 0.0001 wt. percent to about 1 wt. percent levulinic acid. 26. The composition of claim 25 further comprising from about 0.001 wt. percent to about 1.0 wt. percent melanoidins. the absence of a muscle protein. the absence of shellfish allergens. 29. The composition of claim 28 further comprising levulinic acid. 30. The composition of claim 28 further comprising 0.01 wt. percent to about 1.0 wt. percent melanoidins. 32. The composition of claim 31 further comprising levulinic acid. 33. The composition of claim 31 further comprising 0.01 wt. percent to about 1.0 wt. percent melanoidins. 35. The composition of claim 34, wherein the glucosamine composition has an ash content below 2 percent. 36. The composition of claim 34, wherein the glucosamine composition has a heavy metal content below 20 parts per million. 37. The composition of claim 34, wherein the glucosamine composition is formed by acid hydrolysis of a fungal biomass. 38. The composition of claim 34, wherein the glucosamine composition is formed by acid hydrolysis of fungal biomass by treating the microbial biomass with acid at a temperature of from about 90° C. to about 160° C.
wherein the glucosamine composition has an oxygen radical absorbance capacity of from about 30 μmole TE/g to about 150 μmole TE/g. 40. The composition of claim 39 wherein the glucosamine composition has an oxygen radical absorbance capacity of greater than about 35 μmole TE/g. 41. The composition of claim 40 wherein the composition further comprises 0.01 wt. percent to about 1.0 wt. percent melanoidins. US1034121A (en) * 1911-03-27 1912-07-30 Eugen Ketterer Valve-gear. CH634855A5 (en) 1983-02-28 Process for the production of new derivatives of beta-1,3-glucan.